My colleagues and I are extremely upset with regards to the SCOOT incident and services on 12 July 2018. We are supposed to be on board of our flight TR975 at 9:50 pm from Hong Kong to Singapore. 3 of us checked in and sat at Gate 215 area, there was no announcement being made. As mentioned to the officers on ground and over the phone, should’nt there be any calling if 3 passengers already checked in when they are not on board? We saw the plane was still there and requested them to let us on board. They did not check and strictly just replied NO in a rude manner!!! We have been waiting at Gate area 215 and there were 3 officers sat at their counter. Shouldn’t they have the courtesy to check with us if knowing there are 3 persons still missing to board? There’s no security check being conducted and the flight just left us at the airport!!!! We questioned the officers and ended up Ms Josephine Cheung raised up her voice on 3 of us. We were totally annoyed by her attitude towards us. I called 3 times to Scoot office and spoke to 3 different officers, trying to get help at the soonest possible. Surprisingly and being so disappointed there was no help being rendered to us. 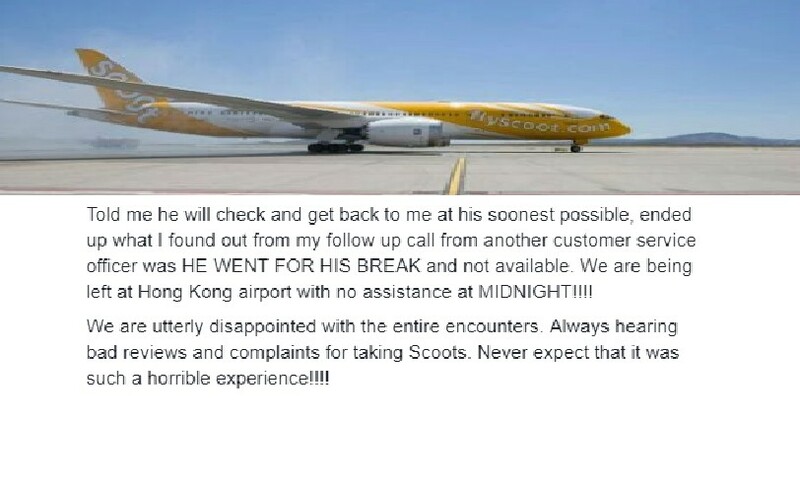 We seriously felt that we should not be deserved for such a bad service from Scoot. Alvin who was the manager just told us to pay to arrange another flight back?!!! There’s nothing much if he could do and may go ahead to lodge a complaint. Told me he will check and get back to me at his soonest possible, ended up what I found out from my follow up call from another customer service officer was HE WENT FOR HIS BREAK and not available. We are being left at Hong Kong airport with no assistance at MIDNIGHT!!!! We are utterly disappointed with the entire encounters. Always hearing bad reviews and complaints for taking Scoots. Never expect that it was such a horrible experience!!!! We strongly feel that the MANAGEMENT of SCOOT should look into the area of customer services and support! We demand the compensation for our monetary, time and emotional loss for this incident. Next Article CHEATER HIDE $50 AND SAID HE DID NOT RECEIVED HIS CHANGE!